Women have health concerns that are unique, and increasingly turning to herbs to treat conditions of hormonal imbalance. Many herbs traditionally used for women's health conditions have an estrogenic action. Most of the health problems that are specific to women can be traced to our endless cycle of hormones. Most women experience symptoms of hormonal imbalance because of the demands made on their bodies. The average onset is 48, and occurs in over 80% of women triggered by hormonal imbalance. The great majority of women can rebalance their hormones without the use of drugs. Many women around the world have been using various herbs for menopause and improving their health for thousands of years. Natural herbs used for women's health are extremely safe and effective. They are much healthier without the worry of harmful side effects that synthetic drugs may cause. Natural herbs are a concentrated source of nutrients, rich in iron, magnesium, niacin and vitamin E.
Certain herbs are best known for their beneficial effect on hormone functioning due to their mild estrogen-like properties. They also have anti-inflammatory, antispasmodic, diuretic, promotes menstrual flow, widens blood vessels and contracts tissue. These herbs are known to relieve menopause symptoms, alleviate hot flashes, night sweats, anxiety and depression, treat PMS, alleviate fluid retention, muscle spasms, vaginal dryness, premenstrual discomfort, stimulation of vaginal maturation, sooth irritated and congested uterine, cervix, and vaginal tissues, improve mental acuity, alleviate symptoms of daily stress, as well as overall health. 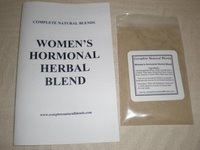 Certain herbs will promote hormonal balance, and provide a natural and gentle relief for the three key hormones that fluctuate during menopause: estrogen, testosterone, and progesterone.